A former Burgess Hill Town footballer – who also played for Brighton and Hove Albion – was caught with thousands of canisters of laughing gas. Leon Redwood admitted to possessing 6,500 canisters of laughing gas and paraphernalia, with intent to supply - Sussex Police’s biggest ever haul. Some of the 6,500 canisters of nitrous oxide seized from footballer Leon Redwood's car by police in Crawley, Sussex. 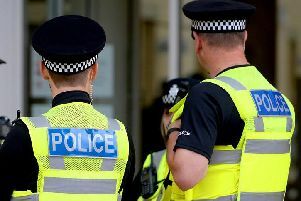 The footballer – who has also played for Eastbourne Borough, and Lewes FC – was stopped by officers in July last year after a concerned member of the public spotted a car being driven “suspiciously” in the 27-year-old’s hometown of Crawley. Just under 6,500 canisters of nitrous oxide, also known as NOS or laughing gas, was found in the semi professional football player’s car, alongside balloons and a device which transfers the gas into the balloons. The 27-year-old appeared in Guildford Magistrates’ Court on Friday where he was given 60 hours of unpaid work and ordered to pay £170 in total costs. Leon Redwood was stopped by officers after a member of the public spotted a car being driven suspiciously in Crawley. Redwood played at Championship club, Brentford in 2013 after he was released by Brighton and Hove Albion. According to transfermarkt.com he currently has a contract with Lewes FC until June 30, 2019. Tandridge Borough Commander Dan Gutierrez said: “Thanks to the member of the public who made the call regarding suspicious activity. “It just goes to show that if you are concerned about something, to let us know on 101 as, from it and Constable Philip Howells’ stop, we’ve secured a record haul of nitrous oxide. “While it may be called laughing gas, it is no laughing matter as the possible side effects can be fatal. Eight people across the UK died in 2016 after inhaling nitrous oxide, which can lead to the loss of blood pressure, fainting, and heart attacks. It is warned that prolonged exposure to it could lead to bone marrow suppression and poisoning of the central nervous system.